I have to travel to Parkes a few times this year and was wondering if anyone knows of any bouldering areas in the area. Maybe any climbers there that would like to show me. Yes I know it is a bit of a stab in the dark but who knows? There's quite a lot of bouldering around Cowra, only an hour or so from Parkes. I was working in Parkes last year - only heard about Cowra towards the end of my stay and thus only got there once. Start up the hill around the botanical gardens, and go for a stroll. There's some cliffs in Nangar NP, and another further north which I can't remember the name of. They're about a half hour from Parkes, then add up to an hour walking time. I was checking out Nangar for climbing prospects a couple of years ago; there are cliffs, but only one section was really solid, and it would need bolts. Heath lives in Dubbo, he has put up a couple of natural lines in the other NP, the name of which elludes me. I'll PM you his details. >the botanical gardens, and go for a stroll. Any further info mate, routes, grades, any loal climbers you know of? I travel to Blayney quite a bit (wife is from there) and Cowra is just down the road. Cowra looks rad from some of the photos I've seen. Conglomerate bouldering. >Cowra looks rad from some of the photos I've seen. Conglomerate bouldering. It is granite, and reasonably good quality at that, but the bouldering is better out Wyangala Dam direction in my opinion. >Any further info mate, routes, grades, any loal climbers you know of? You ought to try Pine Rocks (it is Trachyte), near Cadia/Orange and is better climbing at closer distance. >a couple of years ago; there are cliffs, but only one section was really solid, and it would need bolts. It is an excellent adventure climbing arena that has a lot of potential, albeit on quite sharp rock in places, but nothing that judicious rigging (read long slings), won't overcome. ~> So, I will personally make the effort to travel back to Nangar to chop any uneccessary bolts I hear of being installed there, as it has a history of climbing dating back to the early 80's at least, (even Mikl has climbed there! ), with nary a bolt ever being placed*. (*I personally have done a dozen or so routes there, and am aware of at least that number done by others on various cliffs there. You won't find them on the internet, or in guidebooks, but that is the beauty of the place...). Sorry - got it confused with another town nearby which will remain nameless. 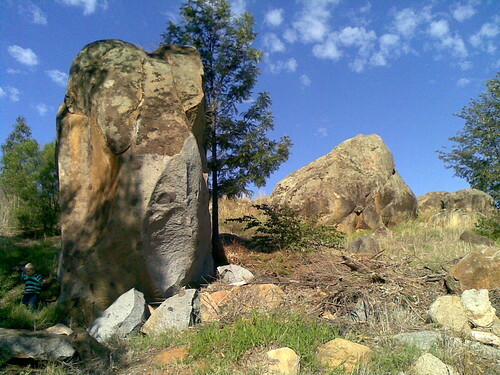 Cowra has Granite boulders and heaps of them. This little cluster is just near the skate park with plenty of routes done on them but i dont know the exact details of them. >with nary a bolt ever being placed. Climbing at nangar came up on crag x a few years back and no-one offered any info re the climbing there...what ya got guide wise M9? I wouldn't use what people tick on their profile as very meaningful information. I know for a fact that Liam has done plenty of adventurous climbing around Australia and the world. >any info re the climbing there...what ya got guide wise M9? A few personal notes on scraps of paper. I personally asked Mikl who had a broken wrist/arm at the time(?) and was working at Mtn Designs in Canberra, what routes he had done there (not that I'd expect him to remember me!! ), and he was suitably vague about it, saying in effect 'go for your life, and consider anything you do as a first ascent!'. I followed up with the Forbes Senior Scouts in the early 90's, who had done routes there in the 80's, but likewise they were not documented in any official way, even though I found their painted initials on some clearly 'do-able' natural lines. The main line I did, was the arete just left of the natural gully splitting the headwall at the apex of the horseshoe rim of cliffs at its highest point (you will need a couple of rurps!! ), along with a line not too far further left (facing the cliff), of that. Most of the other stuff I did was with beginners on the easier angled western ramparts, though in my opinion the greater potential is on the steeper eastern ramparts. There is another thread on Chocky about climbing there. It is an adventure area and should remain that way. Since the lack of documentation precedent had already been set, that is why I chose not to publish those climbs, to preserve the adventure for others. >I wouldn't use what people tick on their profile as very meaningful information. Whatever. Chocky is full of similar contradictions... So, going on internet-face-value, if you haven't gathered already, I am not attacking the individual but instead am reasonably passionate about not placing uneccessary bolts there, and that is the (potential) issue I was responding to. It has been a while since I was there, but basically head toward Cadia minesite and at the top of the plateau before heading straight on to Cadia, hang a left at a road intersection, and go downhill into the State Forest area. There will be a track on the left saying Pine Rocks. Ignore it!!!! Instead take the next track on the left past the signposted one, and it will lead you up towards the climbing area. The other thread I linked to earlier has more info?, ... or at least a possible climbing contact in Orange to go there with! ~> It is about 2 km due north of the Cadia Minesite. awesome cheers M9. will check it out. it'd be nice to have some climbing closer than Tarana or the blueys for half days and stuff. This could be a good case for socially accepted no bolt crags. Maybe that could be a good thing. That photo that pops up I must say is begging for a boltng. >the exact details of them. Thanks heaps for that photo mate, will deffo check it out in 2 weeks time! If there is anymore info as to grades and lines (well, obviously not the obvious ones!) that'd be much appreciated. Can you mark it on a google map please mate? Cadia is indeed very close to Blayney. Paulie. That's the rave cave at wingello. One day heros favorite crag.